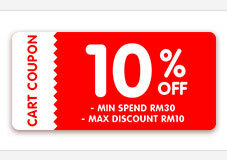 Good price when using voucher. Highly recommended n fast delivery. Sorry I didn't notice the delivery only at selangor. Can u help me to change the address without cancel my order please? Noted new address and recipient updated. Johor bahru delivery no longer available? Why I can't buy ,w packet? When can buy second pack? The item delayed to deliver. Requested to do refund but nothing has been done. Now is already end of August 2018. Almost 3 months they just ignore and keep dragging to not refund. this is the worst seller I encountered. see the reviews a lot of complaint of not receive the order. Please provide us your tracking. you should go track the order code. not me to provide. so many months complaining now still want to restart the process. later ask me contact your customer service. but not even give the number or email. How to contact? where to contact? keep asking to contact your customer service but how? where? not even give a contact number or email address. Shouting here they can hear? Similar inquiry has been responded. Thank you. Hi do you deliver to johor postal code 80300? You can check on item description.